Hi Friends! Converting temperature from one scale to another is now just one click away. The table given above shows the calculator for Kelvin to Fahrenheit converter. Just put the required values in the table that will convert it to Fahrenheit in one go. Kelvin and Fahrenheit are the two scales widely used for temperature measurement. Before you convert any value from one scale to another, you must know the formula behind converting that values. Following formula is used to convert Kelvin into Fahrenheit scale. The temperature in Fahrenheit is equal to Kelvin times 9/5 minus 459.67. Following table shows some common values used in Kelvin to Fahrenheit converter. Kelvin is a thermodynamic temperature scale, based on Absolute Zero – the temperature at which all thermal motion stops to flow. It is denoted by K and is not written in terms of degree sign unlike other two scales Fahrenheit and Celsius that are widely written with a degree sign. The freezing and boiling point of water can be expressed in Kelvin and Fahrenheit scale and are described with the following values. The Kelvin scale is named after physicist Baron Kelvin who pointed out the need of “absolute thermodynamic scale. The Kelvin scale was written with degree sign before 1968, that made people skeptical where there were unable to find the difference between Rankine and Kelvin scale and most of them considered K with degree sign as a Rankine Scale. In order to remove any confusion, the degree sign was omitted in 1968. Additionally, degree sign indicates the arbitrary value as in case of Celsius and Fahrenheit, while K value truly paints the absolute value. Fahrenheit can be defined as a temperature at which water freezes at 32 F and boils at 212 F, indicating boiling and freezing point values are equally separated by 180 points. 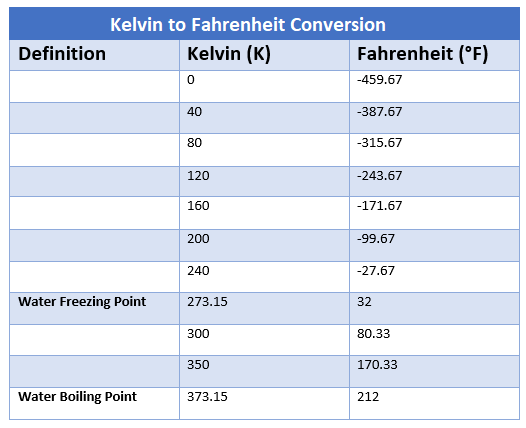 Fahrenheit and Kelvin are somehow related to each other with some offset value. The point worth mentioning here is that all these values are calculated and measured at sea level with standard atmospheric pressure. Fahrenheit is a term named after German physicist Daniel Gabriel Fahrenheit who introduced this scale in 1724. He proposed the scale based on the ice-salt mixture, defining 30 F as the freezing point of water, while the normal body temperature was around 90 F.
These were based on the initial experiment, that came with some flaws, and failed to predict the actual freezing point of water and body temperature. However, once these terms came to sheer limelight and started using as a fixed reference for a thermometer, these values were adjusted, stating 32 ºF as the freezing point of water and 98 ºF as the normal body temperature. That’s all for today. I hope you have found this article informative. If you are unsure or have any question, you can ask me in the comment section below. I’d love to help you in any way I can. Thanks for reading the article.